NASHVILLE, TN (June 18, 2014) – The extensive collection of honors and awards keep rolling in for The Oak Ridge Boys. An official RIAA commemorative plaque certifying Gold, Platinum, and Multi-Platinum album and single sales has been awarded to the Grammy-winning group in celebration of more than 41 million album sales worldwide. A special presentation took place in New York during the legendary group’s appearance on The Wendy Williams Show. "We love Wendy Williams and she recently invited us to perform on her high energy, nationwide show. 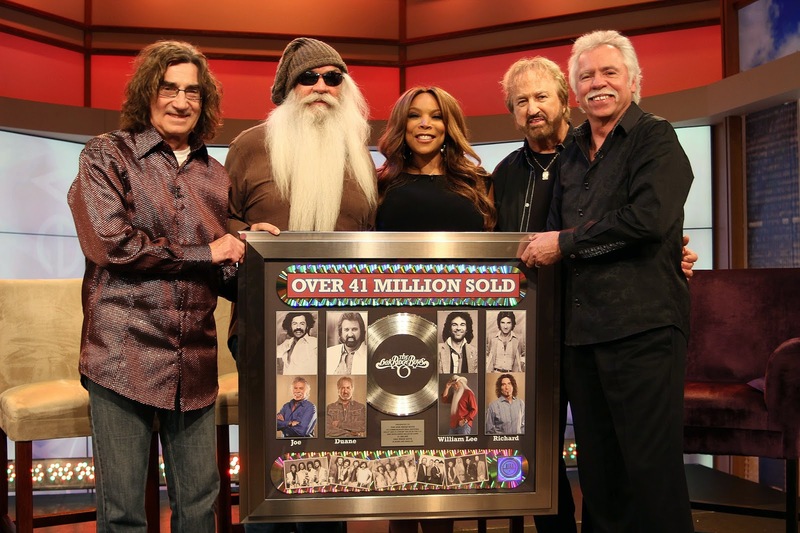 While we were there she surprised us with a plaque recognizing 41 million sales of our albums," says Oak Ridge Boys lead singer Duane Allen. "It is hard to imagine that we have sold 41 million albums and that doesn't even count the successful Gospel music days," adds tenor vocalist Joe Bonsall. "It is humbling to know that the music we have created together has been so well received over all these years. We are very blessed but the pressure is on... 41 million albums in 41 years means we have to sell a million this year to make it 42/42 next year!!!" The achievement comes in wake of the group's 41st anniversary and the recent release of the new Boys Night Out CD (Cleopatra Records). It's their first-ever live Country album featuring all their iconic hits, including "Elvira," "Y'all Come Back Saloon," "American Made," and "Thank God for Kids." The Oaks' latest studio CD, It's Only Natural, is being sold exclusively at Cracker Barrel Old Country Store® locations for $9.99. It was chosen among 12 select albums for Cracker Barrel's summer music promotion.